Earth's atmosphere can be separated into four layers as shown in Figure 09-07a and explained in more details in the followings. 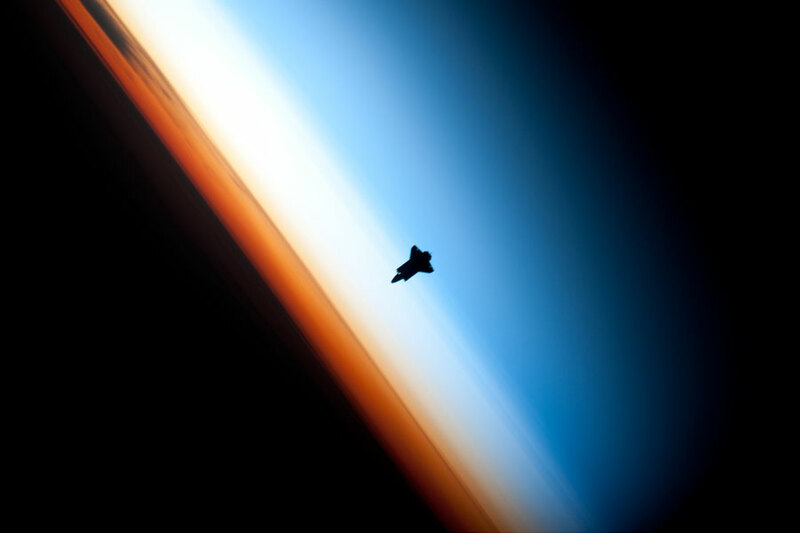 Figure 09-07b shows the atmospheric layers taken by astronaut on board the International Space Station as the Space Shuttle Endeavour coming in to dock. Several layers of Earth's atmosphere were visible. Directly behind the shuttle is the mesosphere, which appears blue. The white layer is the stratosphere, while the troposphere is in orange color. The ionosphere is transparent except producing auroras occasionally. Troposphere - Since this lowest level of the atmosphere is heated mainly by infrared radiation from the ground, its temperature decreases with increasing altitude. It is a turbulent layer within which rising plumes of moist air condense to form clouds of water droplets and ice crystals. Stratosphere - The temperature rises in this layer because the presence of ozone which strongly absorbs ultraviolet radiation from the Sun. This process incidentally blocks the harmful radiation from reaching the ground level. This is a uniform layer and almost weatherless. Flying in the stratosphere is generally smooth, and the visibility is always excellent. The air is thin and offers very little resistance to a plane. Hence it is a region preferred by jet airline pilots. 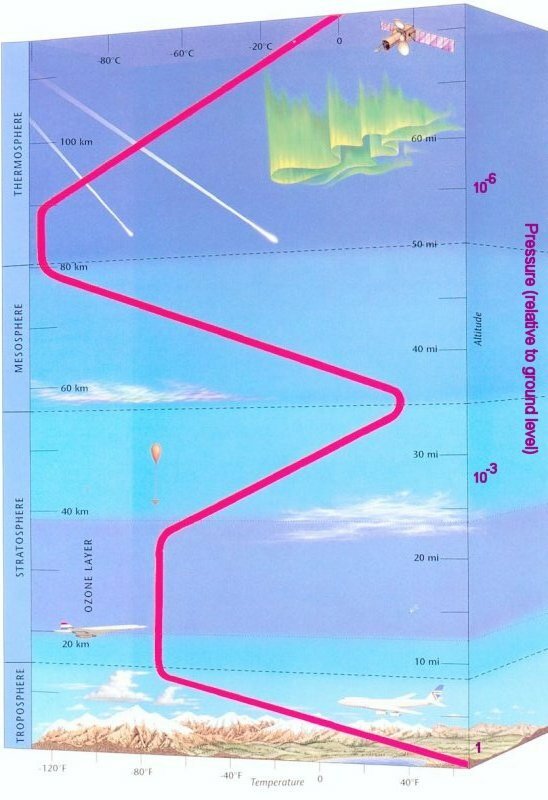 Weather balloon can fly up to this level before it bursts at about 30 km. Mesosphere - In this layer, concentrations of ozone and water vapor are negligible. Hence the temperature is lower than that of the troposphere or stratosphere. With increasing distance from Earth's surface the chemical composition of air becomes strongly dependent on altitude and the atmosphere becomes enriched with lighter gases. At very high altitudes, the gases begin to form into layers according to molecular weight, because the force of gravity is greater on the heavier molecules. It is in this layer that foreign bodies (such as meteors and spacecraft) entering the atmosphere start to warm up. Ionosphere (Thermosphere) - The temperature rises again by absorbing ultraviolet and x-ray radiation from the Sun. This process ionizes the atoms and molecules, thereby adding heat energy to this layer. The temperature can reach up to 2000 oK or more beyond this layer, depending on the level of solar activity. The layers of charged particles reflect radio signals around the curvature of the Earth. Major solar storms that eject large quantities of radiation and energetic particles cause dramatic changes in the ionization levels and subsequent disruption of radio communication. The Earth's magnetic field acts as a shield that deflects the solar wind (stream of electrically charged particles) thereby creating an elongated cavity in the wind that is called the magnetosphere as shown in Figure 09-08. 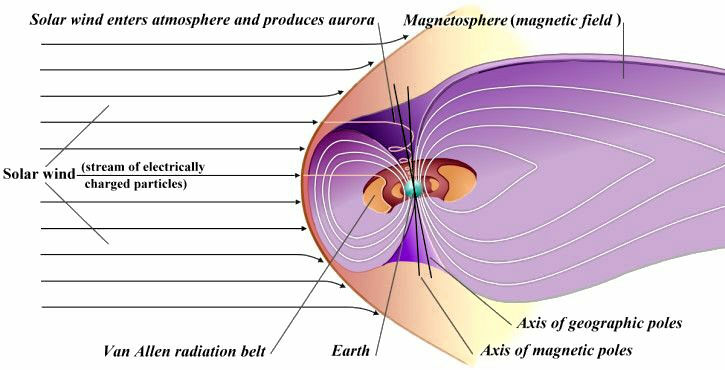 The magnetosphere contains large numbers of trapped charged particles, many of which are concentrated in two doughnut-shaped belts called the Van Allen Belts. Disturbances in the solar wind induce batches of charged particles down the field lines into the upper atmosphere around the polar region. These particles interact with atoms and ions to produce auroras as shown in the top right of Figure 09-07a.